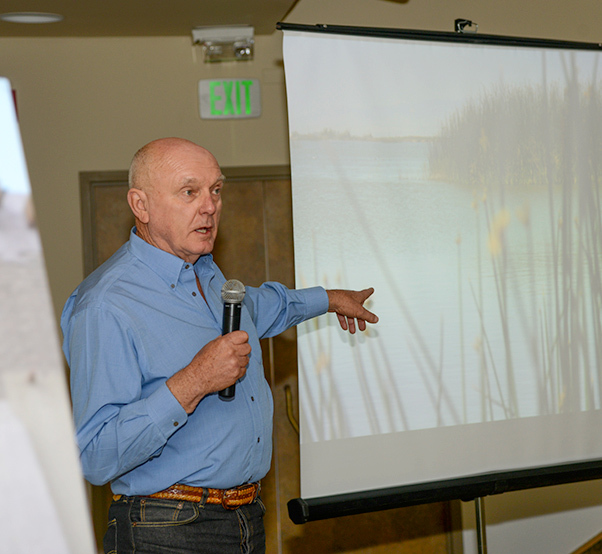 Dr. Bruce Love shows a photo of Piute Ponds, which he says is much like what the Antelope Valley used to look like before the dry lakebeds were formed. 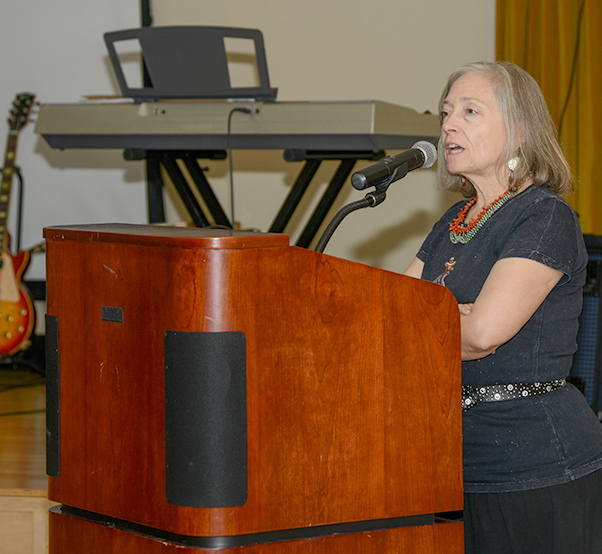 Team Edwards learned about the people who have had a presence at Edwards for the last 10,000 years during the Native American Indian Heritage Month Luncheon Nov. 12. Luncheon guests turned their attention towards a projector set up in Club Muroc for Dr. Bruce Love, an independent researcher who is said to have more than 30 years of experience in the Antelope Valley in the fields of archaeology, ethnohistory and cultural anthropology. According to Love, most archeology is done on the surface by walking back and forth recording evidence and findings. It’s not until items are actually discovered on the surface that they start excavation. According to Love, one finding in Willow Springs uncovered shell beads that were radiocarbon dated to 8,810 years ago. The beads would have been used by native people for jewelry, decoration and sacred ceremonial items for burials. Love shared that much of the local archeology is directly connected to the lakebeds. “Instead of being a couple of small dry lakes like we have here, there was at one time a major lake towards the end of the Ice Age before it dried up 8,000 years ago,” he said. 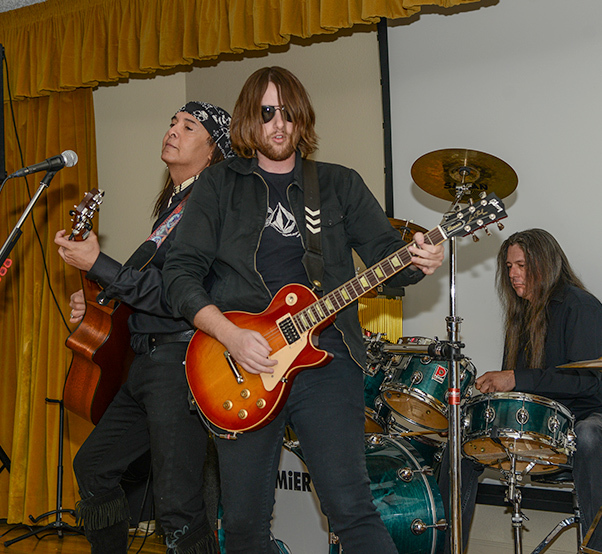 Live music for the Native American Indian Heritage Month luncheon Nov. 12 at Club Muroc was provided by the Jimmy Lee Young Band. The Antelope Valley, he said, once looked more like Piute Ponds. In fact, Love said the Antelope Valley really isn’t a valley at all — it’s a basin. All of the water drains in the middle, which is the reason the lakebeds exist today. Another exciting discovery that Love talked about is the base of a clovis point that was discovered on Edwards. The clovis is the oldest style of projectile point known in North America. Its telltale signature is a fluted groove at its base. The one discovered at Edwards had been sand-blasted, which he attributed to lying on the surface of the lakebed for 10,000 years. Piute Ponds has also been a place of discovery. Crescents that were believed to be used for hunting birds were found in areas that are used today for duck hunting. Love said the discovery got him thinking about the possibility of 10,000 years of duck hunting at Piute Ponds. According to Love, lakeshores are excellent areas for discovering artifacts because those are the areas where native people lived, hunted, were born and buried. He cautioned however, that if an individual does find an artifact to leave it alone. Taking the item out of its original context is like “ripping a page out of the history books” and destroys the history. The other guest speaker of the day was artist Nadiya Littlewarrior who shared memories of her favorite uncle, Capt. 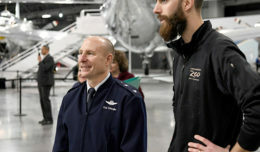 John Dee Whipple,a retired U.S. Air Force fighter pilot. “He was my hero,” said Littlewarrior about her uncle who was stationed at Edwards on several occasions. Growing up on a cattle ranch in the South West Texas Panhandle, Littlewarrior “knows for a fact” that she has seen a UFO. Artist, Nadiya Littlewarrior, shared memories of her favorite uncle, Capt. John Dee Whipple, retired Air Force fighter pilot during the Native American Indian Heritage Month Luncheon Nov. 12. Littlewarrior was given her name from her family after she was born weighing four pounds, eight ounces. She is Cherokee and Irish on her father’s side and Potawatomi and French on her mother’s side. Her history has greatly influenced the woman she is today as a contemporary Native American artist. Live entertainment for the luncheon was provided by the Jimmy Lee Young band while guests ate dishes like squash potatoes. 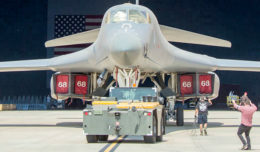 In his closing remarks, Col. David Radomski, 412th Test Wing vice commander, said observances like this one are about building a team mentality among the test wing.